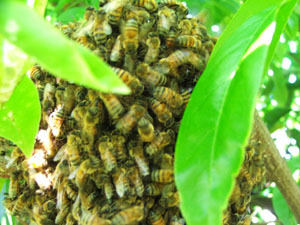 Improving Internal Communications with Social Media: Behave like a Beehive? Note: Very few images show bees communicating so I went with the multi-bee approach. Forgive me! Organizations can learn so much from insects– more specifically, bees. Bees have an amazing internal communication plan. They communicate with a dance and by releasing pheromones. They’ve even discovered how bees tell one another to stop collecting honey. I think when it comes to social media, organizations should behave like bees and work to facilitate communication between staff. By improving internal communication, it would also allow organizations to let staff to go free and cultivate their own audiences (or flowers). This brilliant plan of mine however, takes hard work on the side of internal communication so that goals and priorities can be met. Unlike bees, our priorities aren’t always to collect honey(or raise young, or guard the hive), they tend to differ between department are are extremely complex. No matter the size of your nonprofit, sometimes internal communication falls to the wayside. Especially when you have supporters who need your attention. The benefits of keeping internal communication strong though, is that you will provide BETTER information to your supporters while serving the community and the cause more effectively. There are several ways to use social media to benefit internal communications. Many companies and organizations have an intranet or newsletter that regularly serves as a reminder of current projects and priorities. While these techniques are good, they are mostly one-way and offer little collaboration with sharing ideas, and offering fast and current updates that happen suddenly. I’m going to share a few ways we use social media to improve internal communications at the National Wildlife Federation– but I encourage you to share your ideas as well. 1. Google Chat or AIM – many of us at NWF use Google Talk or AIM to chat with coworkers, we still pick up the phone when needed, but chat allows us to answer quick questions AND document what’s said so that it could be used as a reference later. 2. Skype Chat – Skype was something we used more frequently a few years ago, but it’s a great way to create chat rooms that can be saved. Instead of conversations that are one on one (like in Google chat) we could hold greater discussions. 3. Yammer – Yammer is our internal “Twitter”, that allows us to update people and coordinate messages we tweet and prioritize. We also use it to ask questions and circle back on social media thoughts or resource sharing. 4. Twitter – Staff chat and support one another on Twitter, helping spread the news of important things and staying up to date on current events. 5. Facebook: Many staffers will also chat through Facebook chat as well as re-post updates that we see are interesting from our news feeds. We still have a long way to go when it comes to letting all of these tools talk to one another. There are new plugins and tools all the time. For example, Yammer can be integrated into your Outlook, Downloaded to your desktop or smart phone, and connected to your Google Talk. With all of these options (and you better believe I have all of them) — it can be hard to suggest what is the most useful because it differs for everyone. However, the import thing to know, is that the more we behave like bees, the happier I’ll BEE.